Make your WiFi network smoother using proper channel planning to avoid an interference issue. 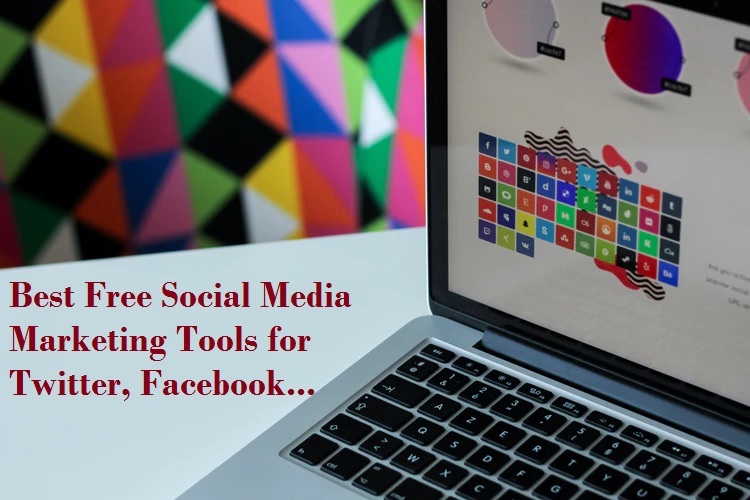 you can use the some best wifi network analyzer software tools to planing a large WiFi network. IEEE always working on technology to get next level performance every second. So Wi-Fi technology also is going up to the next upgraded level every day. before a few years ago when wireless technology discovered we get speed in kbps and day by day we get speed 2Mb then 11Mb and 54Mb. If we talking about today Wireless technology than we feel happy because we get almost cable connection speed over wireless also. To create a successful hotspot solution there are many free wifi stumbling and heat map tools available. Heat Map tools give your complete signal range with each and every area with an interactive color graph. For a small and medium size WiFi solution you can use many free wifi tools for wifi survey and signal analyzer. Looking for WiFi router see the best dual band wifi router under $30 (2000 INR). 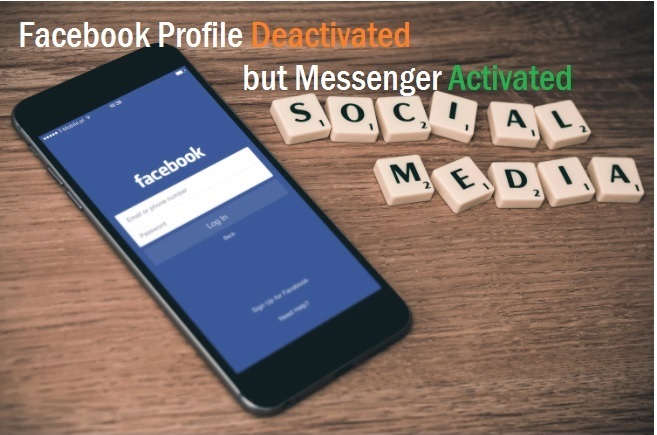 When technology grows and become popular than it also starts to make congestion of network, everyone knows Wi-Fi work on an RF (radio frequency) so with increasing of the user its make high-level network congestion in the air and we start to get poor connectivity. This frequency congestion called interference and we cannot see visually frequency interference so we required some tools to get the air congestion of frequency broadcasting by many wireless devices. Now the Wireless technology takes over by fiber networks. learn more about fiber network deployment and OLT, ONU device. If you are a network professional than you must understand about RF interference but non-technical face problem in Wi-Fi they must understand about frequency interference first. Actually when multiple same frequency air in a single place than they overlap each other and create interference. When frequency overlap each other than its effect Wi-Fi speed and our internet speed goes down every time. To avoid any WiFi network connectivity issue due to interference need a network analyzer software to troubleshoot a network issue. 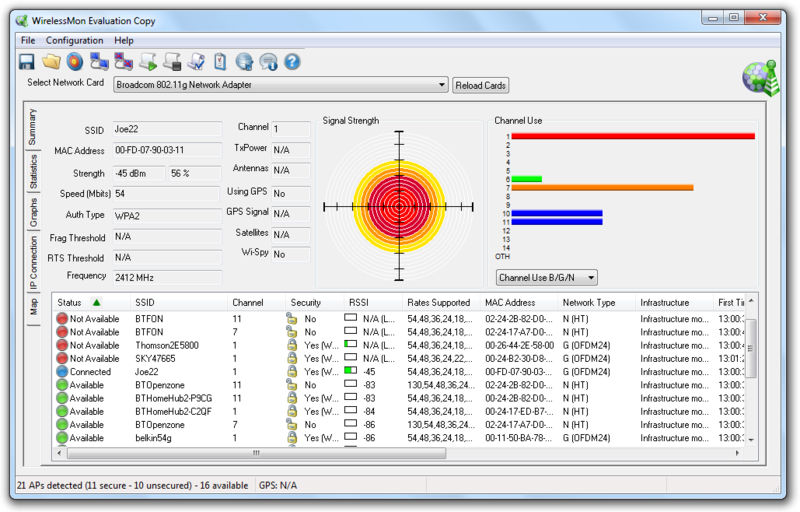 Inssider is a free tool for analyzing and testing of Wireless frequency. It’s a most useful tool for the network administrator to manage their wi-fi networks signal strength and stability. 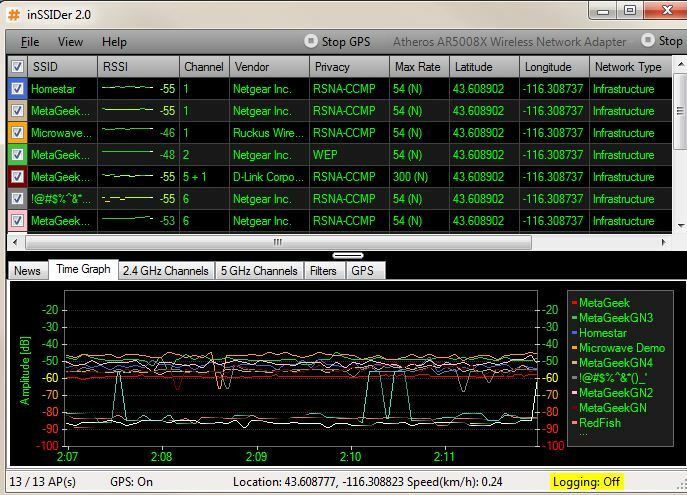 use insider WiFi analyzer tools to get excellent signal coverage on every area. Insider free Wifi tools for Windows, Mac, and Android operating systems. you can check RSSI, Mac-address, Channel No. , Vendor information, Data Rate, Security Type, Network Type, Signal Strength Graph. 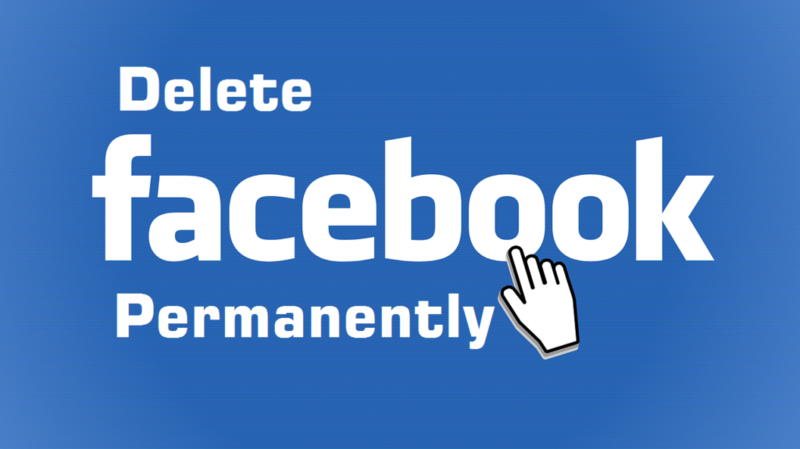 Refer to picture given below. Inssider support both 2.4Ghz and 5Ghz band to analyze and show signal strength of each Access point broadcasting. You can also see the graphical status of signal fluctuation to know to your Wi-Fi network stability and disturbance due to interference. Its support windows and Mac both operating system. You can download the free version and paid version with the pro feature from official metageek.com. Network Stumbler also very good tools for testing Wi-Fi signal strength. network stumbler is a wifi performance test tool to avoid the interference issue on your WiFi. 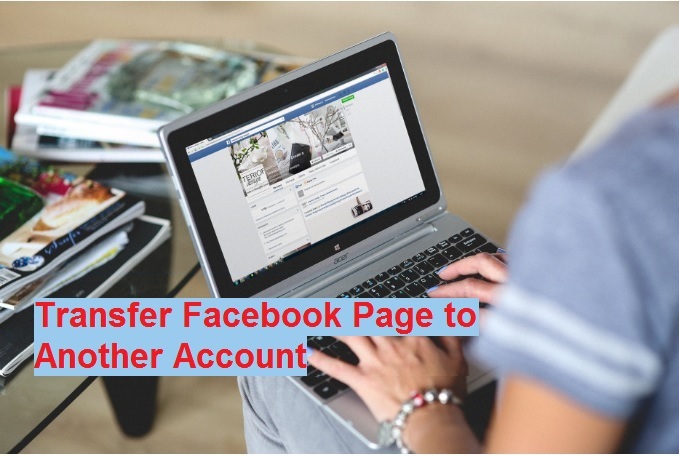 its show you SNR value, Vendor Info, Mac-Address, RSSI, Refer to Picture given below. Its sniff the network signal from various Access Point and show with Mac details, Vendor details, and SNR value and RSSI status with the number and graphical value. Doing a proper site survey and planning with wifi testing tools always gives you a problem free wifi zone. 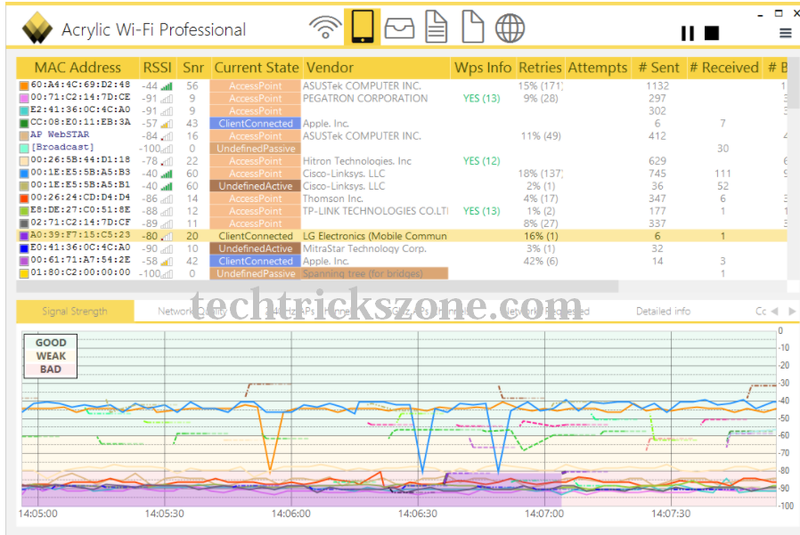 doesn’t matter your hotspot area is small or bigger with the help of wifi analyzer tools for windows or any operating system you use will give your reliable and strong WiFi connectivity. This is another good tool for Testing Wi-Fi Signal testing. Its show you all nearby Wi-Fi signal, Mac address, IP information, DNS information to the connected network. 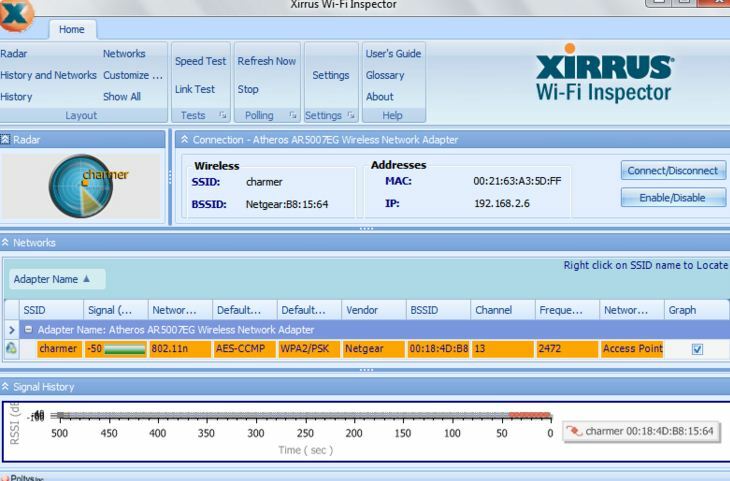 Xirrus Wi-Fi analyzer and signal testing tools are compatible for windows. 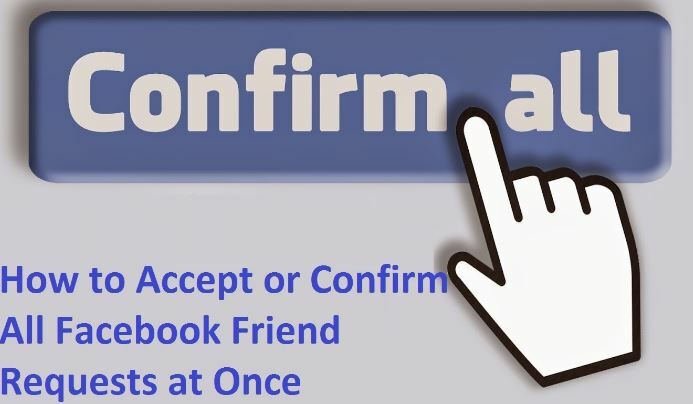 It’s also Detect rogue (unauthorized) APs to protect your network from unwanted attacks. With Xirrus you can also view your wireless settings and Network connection status. 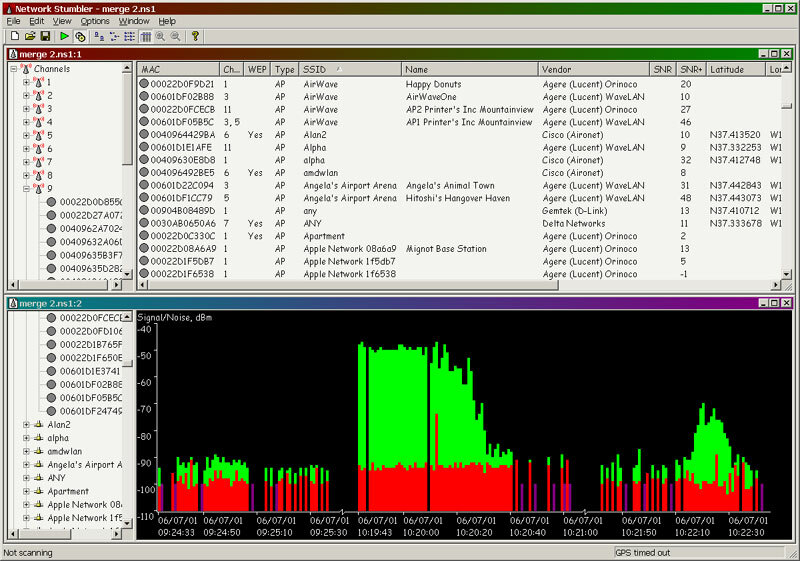 Wireless Mon is a tool to monitor the status of wireless Wi-Fi adapter(s) and gather information about nearby wireless access points and hot spots in real time. Compatible with Windows Xp, Vista, Windows 7 and 2003. You can also map you AP with GPS logging for signal strength. 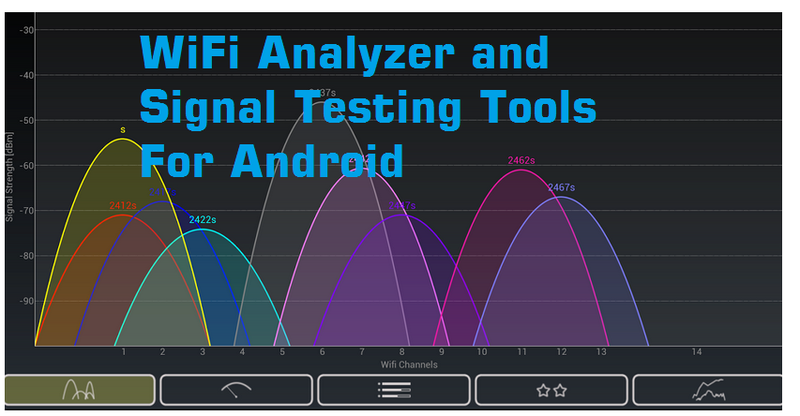 Wireless analyzer tool will help you find your Wi-Fi antennas are connected properly and working fine as they should work. Wireless Mon will get you details information about each and every Wireless device connecting to your network which will help you to make stable network connectivity always. This will show you signal strength as well as the data rate of every AP also if all AP using same Wi-Fi SSID name. It will show you connected AP security type data rate and signal strength. Acrylic Wi-Fi analyzer one of the best tool to manage Wireless access point for small and large network both. Its support 802.11/a/b/g/n/ac sniffer and Wi-Fi networks analyzer.Maximum data rate supported by the access point with AP client packet retry rate information. Its complete wire shark integration supported and packet viewer with complete WiFi connected device details and unlimited inventory supported. Acrylic trail version was available free of cost for 30days and paid version with the pro feature with unlimited validity.